The first production Daimler Benz powered Bf-109s were the E variants. 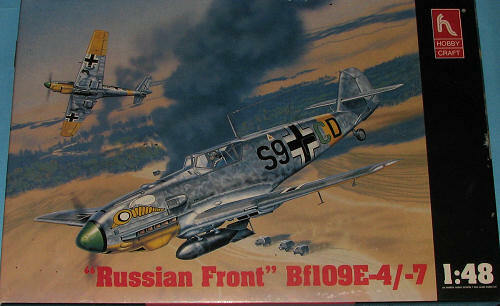 These started with a number of preproduction aircraft, the Bf-109E-0. In the numbering system used at the time in the Luftwaffe, preproduction planes were all '-0' after the model number. Depending on the aircraft type, this could mean just one plane or a couple of dozen. The Luftwaffe used the 109E-0s in propaganda to make people think that it was the Bf-109D. In reality, the Jumo powered 109D was in some ways inferior to the previous Bf-109C in that the D used a carbureted engine where the C had fuel injection. The deception is still enough to foil many modern authors who tend to use older books as references rather than doing any actual research into the subject. Anyway, the Bf-109E had several differences from the earlier Jumo powered aircraft other than just the engine. Because of the DB.601, the cowling was much cleaner than with the Jumo. The large under nose radiator was gone replaced by a small oil cooler radiator. The coolant radiators were embedded partially into the wings leaving little to the airflow, but able to pull in all the required cool air needed. The rest of the airframe was pretty much the same as with the earlier models. The E-1 and E-3 were built concurrently with the at about a 47-53 ratio of -1s to -3s. The difference in the two was wing armament. The E-1 had four MG 17machine guns, two in the nose and two in the wings. The E-3 had MG FF 20mmcannon in the wing and can be distinguished from the E-1 by small under wing bulges to clear the cannon feed mechanism. In all other respects the planes were identical. Though designed to carry a 20mm cannon firing through the prop hub, apparently only two nose cannon armed Bf-109E-2s were ever built with this weapon. It wasn't until the F model that the engine-mounted gun was successfully used on production 109s. As the E-1/3 was replaced on the production line with the E-4/7, older planes were often updated with the newer canopies and a number of these planes were fitted with centerline bomb racks as E-1B fighter-bombers or Jabos. Others were modified to full E-4/7 standards if damaged badly enough in combat or accidents. The E-4/7 version were built with more robust canopies and windscreens, the latter with armored glass. The E-7 was the first 109 plumbed for a drop tank, which helped to improve range, something that was sorely needed, but not incorporated in the aircraft until after the Battle of Britain. Many E-4s were brought up to E-7 standards. Most E-7 versions also had a more pointed spinner. While made obsolescent by the 109F, the E soldiered on in ground attack units and with German Allies. Those who have been reading Modeling Madness for a while know that I have built a few Hobbycraft 109s over the years. While not to the detail level of the Hasegawa or Tamiya kits, they are quite passable and can often be found for a lot less money. They are a great way to use up some of those decals that have been collecting dust. The kit has nicely engraved panel lines, a reasonably well equipped interior with seat, trim wheels, rudder pedals and the whole ball of wax. You also get a drop tank and bomb for the underside rack. The kit includes separate flaps as really its only option. I whined about not having nose guns in an earlier 109E previous review, but must have lost them or something as they are included in the kit. The canopy is clear, but is in the closed position. I should mention that the tan color in the image above is a photo glitch and not the color of the plastic. It very much seems that regardless of which variant of the E you buy, the bits in the kit are pretty much the same. The canopy is a bit too narrow for the opening, probably the one major downside of this kit. You can get vac ones or use one that is spare from other E kits to replace it. You could even spruce up the cockpit with an etched set or resin set and not even come close to the SRP of a Hasegawa or Tamiya kit. 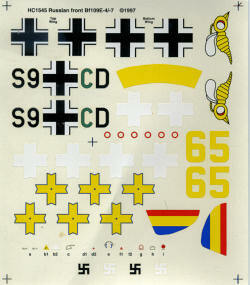 This one is one of the 'black box' kits and so the decals within are going to be pretty darn good. Markings are for a Rumanian AF version, yellow 65, which has been photographed quite a bit. Basically, this plane is listed as being RLM 71 over RLM 76 with a large yellow nose. The other option is for a III./SKG 210 plane in Russia during the opening months of the Soviet invasion. This one is in RLM 74/75/76 with lots of mottling. Bottom line. 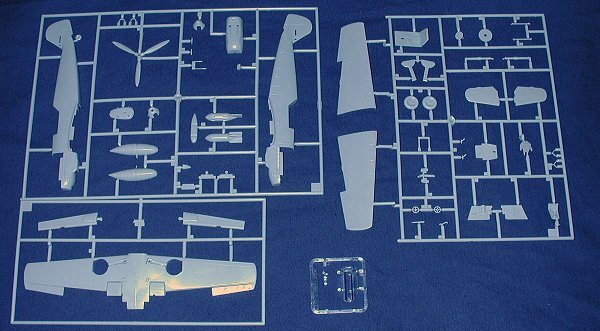 You want a relatively easy to build Bf-109 (and I'll admit that it does take a bit of modeling skill) and don't want to spend $30-40.00 doing it, get this kit. They are easy to find on vendors tables at contests and swap meets. If you are a contest modeler, you won't touch it. If you are like 90% of the rest of us, you'll be quite pleased with the result of your efforts. If you want to trick it out with aftermarket, you can and it will only look better. I have always recommended the Hobbycraft 109s and still do.